The internet growth in India has moved in the fast lane, especially due to the onslaught of low-cost smartphone devices and the resultant mobile internet boom. Moreover, the internet boom is likely to continue its good run as the high-speed 3G services penetrate further into rural areas. In fact, India has plans to embark on advanced 4G mobile services by 2012. Apart from smartphone devices, the evolution of the budget tablets is yet another source of accessing internet while on the move, that will have a positive impact on the growth of internet in India, which is all set to be the third largest internet market in the world after China and the United States. According to Internet in India (I-Cube) 2011 report, the number of ‘claimed’ internet users in India has crossed the landmark 100 million mark in September, at 112 million users (88 million urban + 24 million rural villages) who have used the internet at any point in time in the past. Of 112 million claimed internet population, 90 million users have been ‘active’ internet users who have accessed internet at least once a month. Further the IAMAI report indicates that the positive internet momentum is likely to continue into December 2011 to notch a higher 121 million claimed internet users’ mark, largely driven by youngsters in India including school going kids. While urban metro areas are at forefront in terms of internet growth points, the smaller towns and non-metros have shown a considerable grouped dominance over the top 8 metro cities. 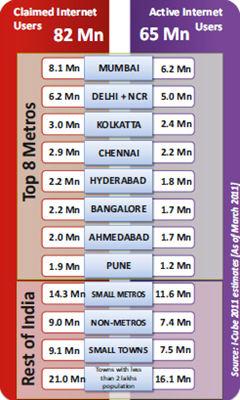 In fact, towns with less than 2 lakh population contribute highest in terms of internet users from rest of the India. Amongst top metro cities, Mumbai’s claimed internet users stood at 8.1 million, followed by 6.2 million users in Delhi and NCR and 3 million internet users in Kolkata. Going by the age segment, the Generation Y dominates the scene in terms of internet usage pattern, with more than three-quarters of internet population driven by young men (27%), school (21%) and college (27%) going kids. The rising segment of school kids is mainly driven by new generation e-learning services and educational information available on the Web. While a majority 89% of the surveyed urban city population use internet to access emails, 71% use it for networking with friends and families. Interestingly, 55% of population use internet for chatting purposes even today. On the other hand, the rural internet users have preferred to download or listen to music and videos to the extent of 46%. So, can India leap on to gen-next 4G technology in 2012, to herald a new era of fast paced internet growth in India? Beware of these 5 marketing gimmicks Shopping Malls employ to make you spend more! This is awesome information and grow rate of internet user in India. That is good information about all information as urbanize area, Metro city and others. The figures are extremely encouraging and this number will keep growing. There is a trend among school going childrens to find shortcuts in using Internet for their school work, we as parents also depend a lot on the internet to resaerch on school projects. Online Games consume a lot of time for these childrens which can disturbing at times. Having said all of this the Web has made research so much easy. That surely is a good sign vis-a-vis to the development of our country. In the years to come if the trend continues it is highly likely to change the market dynamics across the country. Very true, the higher penetration of internet and its usability will certainly make life easier for people and more approachable to various amenities and services alike. The world of internet will open a new life of education and awareness among the rural Indians, enabling to move a step forward towards the realities of life – promoting equality.